English-born Fuss has experimented with early photographic processes since the beginning of his career in the 1980s. Photograms and daguerreotypes have produced hallmark works of descriptive depth and haunting translucence. 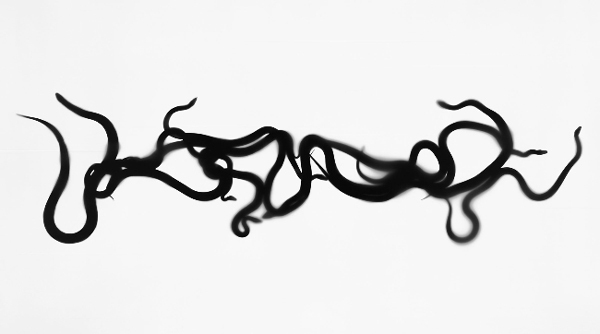 This work from the Alphabet series includes snakes, a longstanding subject of Fuss’s interest, captured directly on photosensitive paper in this large-scale photogram silver print. Languidly moving across the paper, the snakes leave dark tremors of their movement behind, imprinted by the photographic process.